While I’m usually kind of a minimalist when it comes to new tools, I have to admit that my previous strategy for harvesting eggs, berries, squash, and apples wasn’t really working. For eggs, I would stick as many as I could into my pockets and my hands and try very hard not to smash or drop them on the way to the kitchen. This worked great if I was wearing a loose skirt with pockets and a hoodie with additional pockets. However, the day that I smashed two eggs on the inside of my skirt pocket and smashed an additional egg on my doorknob (oh woe!) was the day I realized I needed to make a change. Harvesting apples wasn’t going all that great either. 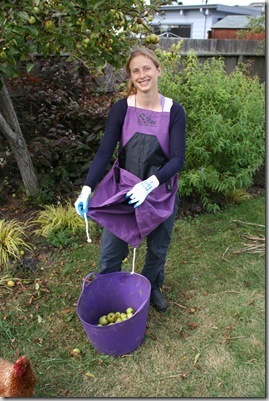 When harvesting, you want to use both of your hands, so it’s tough to hold a bucket at the same time. 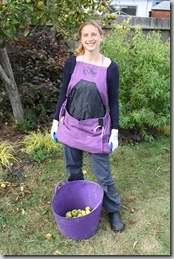 What I usually ended up doing was picking apples with both hands and chucking them into the bucket, which I set on the ground. This works fine if you’re going to use the apples right away. But sometimes I got tired of making applesauce halfway through and left some apples for the next day. The bruises these poor apples sustained, being tossed from hand to bucket, didn’t make for long-lasting fruit. That’s why when Pantry Paratus offered to send me their Roo gardening apron, I took it as a sign (I mean, they come in purple! ), and accepted with great relief. 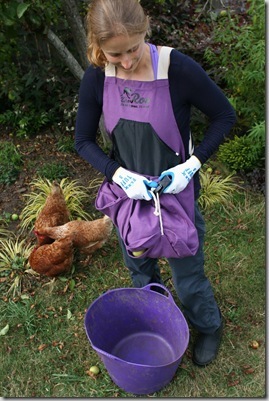 While I don’t usually bother with aprons to keep myself clean, the Roo gardening apron is more about gaining yourself some extra hands then it is about staying tidy. It’s like having a giant kangaroo pocket in front of you, and just like a kangaroo pocket it stays flat and out of the way when not in use, but expands to giant size as soon as you start filling it with stuff. 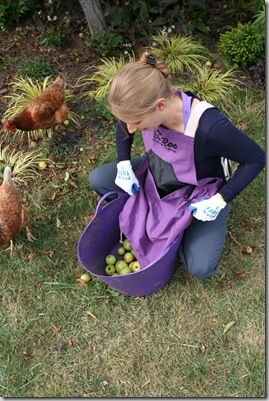 My first test with the Roo was a simple one: collect enough apples to fill a bucket so I could make some fresh juice. As you can see from the photos, it went just fine. In fact if I’d wanted to, I probably could’ve collected a few oversized spiders and a slightly plump kitten as well. But you know me, I get extremely antsy having single-use tools around the house. 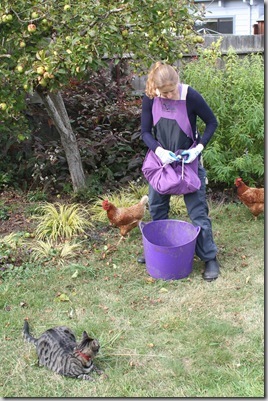 This is why I love things like my hori hori, or my TubTrugs gardening bucket – I can use them for everything. Where the Roo gardening apron really shines is in its multi use potential. Tired of weeding into a bucket? Just pull on the Roo and weed directly into it. Once you have a full load, just empty the Roo right into your compost bin or trash bag. It’s a lot more efficient than the weed and toss, weed and toss maneuver that you usually have to do. The Roo is made of washable canvas and comes in three colors: charcoal (gray is the new black, right? ), a pleasant aqua green, and of course purple. There’s room for your cell phone in the top pocket, and if you’re harvesting delicate things like berries (or eggs), you can slip a little round bucket into the Roo to make sure these things don’t get crushed. It’s also highly adjustable for people of different sizes. The strap adjusts up to an XL size, and there’s an additional strap available for purchase if you suspect you might be larger than an XL. I’ve got mine tightened down to where there’s about two extra feet of strap available, so I think this would fit most people. The only thing I would change about the Roo is that the clip and knot fastener that holds the pocket closed is a little awkward to maneuver. 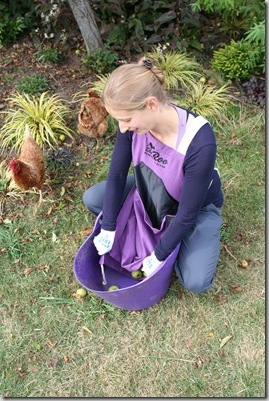 I would prefer a different way of holding the apron pocket closed – something that I could unclip with one hand. Beyond that, I’m really impressed with how well-designed it is. The longer I’ve had it, the more I’ve gravitated towards using it. And, you know, it comes in purple. That makes pretty much anything perfect. 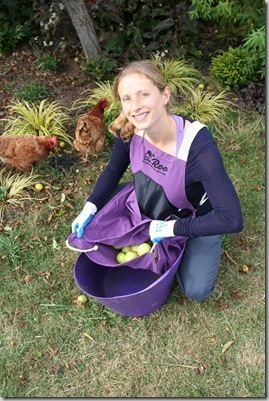 This is such a great idea…I would love the Roo gardening apron in Purple. Thanks! Purple! No apples or plump kittens here but the weeds are in constant need of relocation. Thanks for a chance to win this cool apron! I love the purple color also! I was thinking earlier about something like this, rather than gathering my skirt/shirt to hold our garden’s bounty. Purple, please! Green for me too! I love this idea, and think I would use it for weeding as well! Purple, please. Gathering and weeding can always use simplifying! Love it, Would be wonderful for picking blueberries with basket in it. Purple please!!! What an improvement over grandma’s apron! Purple please. It’s not often that I go through my emails and say “WOW, I NEED that!” but I did this morning. Lickity-split I clicked on the link in your newsletter to this post. Thanks Gen! Brilliant idea. And offering it in purple is added brilliance. Oh, this looks splendid. I think charcoal would be good for me, so as not to show all the grass stains it would be sure to get in my yard. This would be fantastic for so many things. and so much better than the bucket-through-the-belt (can you picture what I mean?) 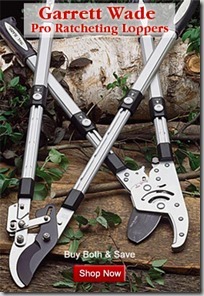 for picking raspberries and blackberries. Charcoal would be lovely. I’d love that apron, seriously! I’d choose green=) Thanks so very much! I’d love to try out a charcoal one. 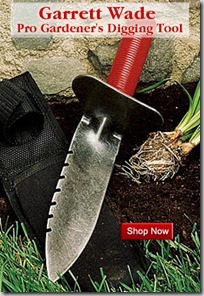 It looks very practical for weeding, which unfortunately I do a lot of. This would sure beat using an old oversized t-shirt. The purple is fabulous. Thanks for the chance to win! May I have the new black -grey? I could have used it for my eggplant this year. Next year it can hold my garlic harvest! I have broken eggs in my pockets, too. Yuck! Oh great. Another Gen review that’s going to make me buy something. Aren’t you just the cutest surrounded by all those critters and in your purple? Anyway, it’s got to be green for me. Trying to wear more color, you know? Why didn’t I think of that. Great idea. Green would look swell! i would love the green for green apples! Green, thank you, I would love to have one. Definitely purple! I could see that being very handy in the barn as well! I’d would love a charcoal (or any color) Roo. Thanks! Charcoal for me, please. Even though the harvest was a bit of a bust this year…..there’s always next year! This sounds like just what I need! I’d love a green one. Aqua green! Oh, how I NEED this! Thanks for another great giveaway, Gen! I wish I came up with this idea ! 🙂 I would really like the purple apron. Just in time for my late bloomers!!!! My name is Tamara Cullen and Chaya from Pantry Paratus shared this write up with me. I own the company that sells the Roo Gardening apron. Thank you so much for your great write up! I am so glad that you have discovered the many uses of the Roo and how helpful it can be from picking apples, to harvesting your veggies and to the not so fun job of weeding. I appreciate your suggestions about the release mechanism on the pouch of the apron. I will definitely take that into consideration. One thing I wanted to suggest that might make it a little easier to release the rope from the clip, is to make sure that the knot on the rope is facing the outside of the apron. I have a Facebook page that I update with all the ways to use the apron. I also have a demo video. 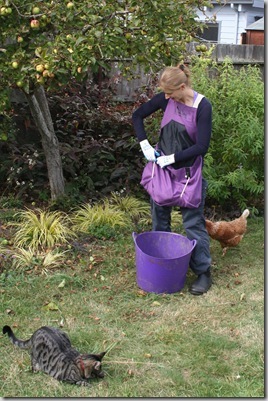 The Roo Gardening Apron is the page name if you would like to share that with your readers. 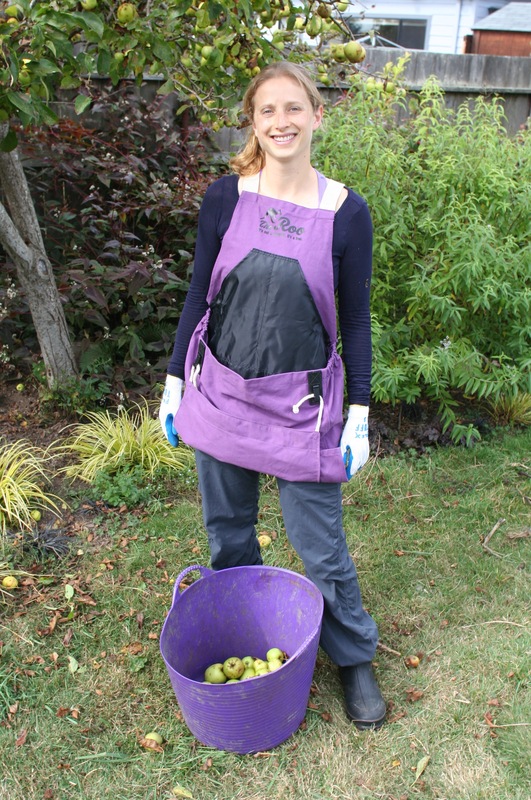 Thank you again for taking the time to use the apron and for giving it such a favorable review. I hope that you have a great day!! Gen, Ths is my kind of apron. I’ll take a purple one please! 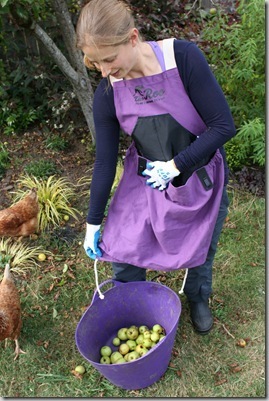 I would love one of these Roo Aprons in charcoal please! Thanks so much for the opportunity! I would love one of these in purple – Kansas State!!! We grow a huge garden and I always have trouble finding places to put my pan when picking green beans and peas. This is the answer to my prayers! Also, when I’m to the top of the apple tree and my bucket is full, this would be the only item I would ever need to pick apples. I can think of a use for this apron all summer long then when the snow flies it would be used in the house for cleaning, crafts and grandkids!! That’s brilliant!! Plus purple is my favorite color! Super great idea with super great colors- would love purple!!! I love this! I would pick charcoal. wow! I didn’t know we got to pick the color of the apron we are trying to win. Perhaps taupe with an ecru edging? Or do you think that is passe? perhaps taupe with ecru trim? In love with the aqua green Roo I viewed on your YouTube presentation. I’m a pocket stuffer (especially as a nurse), so this fits in with my life. So many great household uses for The Roo and it’s just so cute! Thanks for the giveaway. Charcoal would be my color. I’m partial to the green. Green please! It would get lots of use at our place! Going on my Christmas list!